I love this… In her intro, she talks about the perfect dinner parties (with perfect hosts) that they would featured in the magazine, and how she’d always felt embarrassed that she didn’t grow up knowing how to throw a “proper” dinner party. Until one day she realized that these magazine features were always parties of 8 to 12 people, and that, growing up her mom could host 50 to 100 without panic because her secret was the pot luck. But even pot lucks have changed over the years, which is why she was inspired to write this book. These days there are things like dietary restrictions and “Instagram worthiness” to consider. Also, people have become more food savvy and there’s always pressure to bring a standout dish. She wrote Modern Potluck to give people updated, foolproof, crowd-pleasing recipes that will hold up on the buffet table… and to bring people together around food in a way that’s as easy and fun as possible. I made these no-bake enchiladas that I think are pretty darn Instagram worthy, don’t you? :). The recipe starts with a delicious carrot-cumin sofrito that I could not stop eating by the spoonful as it was cooking on my stove. The enchiladas are filled with a cheese, cilantro and pea filling, while the sofrito, avocado, and seeds get piled on top. We really enjoyed this fresh take on enchiladas – especially since it’s a little too hot to turn the oven on! One of my favorite parts of the book is that every recipe has a “Potluck Prep” tip that tells you how to prepare the recpie in advance, how long the recipe will sit out for, etc, etc. This giveaway is now closed, thanks for entering! Recipe from Modern Potluck by Kristin Donnely. Reprinted with permission. Make the Sofrito: In a food processor, pulse the carrots, onion and garlic until very finely chopped. Scrape the mixture into a medium bowl. Add the tomatoes to the food processor and pulse until nearly smooth. In a deep, medium skillet, heat 2 tablespoons of the olive oil over medium heat until shimmering. Add the cumin seeds and toast until they pop, 1 to 2 minutes. Add the carrot mixture and a generous pinch of salt and cook, stirring every once in a while, until softened slightly and nearly dry, about 5 minutes. Add the tomato puree and cook, stirring occasionally, until most of the liquid has evaporated, 5 minutes. Stir in the remaining 6 tablespoon olive oil, reduce the heat to low, and cook, stirring occasionally, until the carrots are very soft, about 1 hour and 30 minutes. Stir in the lime juice and season with salt. (Jeanine's note: my carrots were pretty wet and soft at this point, so I only added 2 (of the 6) tablespoons olive oil, and I continued to cook it for about 30 minutes instead of 1½ hours). Make the filling: In a large bowl, toss the cheese with the peas, cilantro, and onion. Assemble the enchiladas: In a small skillet heat ¼ inch of the grapeseed oil. When the oil is warm, use tongs to cook the tortillas, one by one, until pliable, about 20 seconds for each. Transfer to a plate. Potluck prep: the carrot sofrito, without the lime juice, can be refrigerated for up to 1 week, stir in the lime juice before using. The assembled enchiladas can stand at room temperature for about 2 hours. looks so delicious!! i’m very intrigued by this cook book! Love the look of this recipe and the others too! I love your blog so much, it means a lot to me, I make everything you have ever posted. Going to try the enchiladas tonight! Looks so delicious, as usual! What a cool concept for a book! I love elegant, but unfussy recipes like this for dinner parties. How can you not have a good time when enchiladas are involved? Winner! Mmm. Can’t wait to try! I’m going to try it this week! Gorgeous food and book concept! Love! This looks so delicious! Thanks for the tip about keeping the sofrito in the fridge. I need to do a ton of meal prep each week because I’m working, in school and a parent. So tips like these help out soo much. Oh, awesome! Enchiladas are some of my favorite things to bring to a gathering. I just discovered your blog via One Part Podcast and am so happy! Have already spent hours looking at past posts and making notes for recipes I want to make! The carrot cumin sofrito looks great. I will be trying that recipe. Having moved to a state where a/c isn’t a thing, I’m all about trying new twists on favorite dishes so I don’t have to use the oven! Beautiful colors, made with personal favorites, what’s not to like with this recipe? And easy to adapt to my diet restrictions and still be nummy and healthy. I’ve been obsessed with your blog yesterday as I am navigating going vegetarian/vegan as much as possible! Just got your cookbook recently (which I love) – and this looks like it would be a great complement to it! Love having veggie recipes so yummy the meat-eaters don’t even realize they are going without! Everything about this post is a win-win! Super excited to try out this recipe, and we could use new Snapware! Our container lids are falling apart and looking old and sad. The book looks so yummy! I’m moving to my first apartment and want to start learning how to cook starting with this recipe. Btw, love your Instagram page Jeanine! I love potlucks! This recipe looks perfect. This book looks absolutely fantastic, perfect for the modern woman who doesn’t have time to cook for hours while juggling a million different things. Looking forward to reading it! How cute! Can’t wait to check her book out! So exciting! Love that it can be vegan pretty easily too! That carrot sofrito is like WOW. These look amazing! And I would absolutely love to win a copy if Modern Potluck! This beautiful book is bringing ‘share the love’ potluck the attention it so deserves! Brava! Love this idea and can’t wait to try the recipe! I would love a copy of this book! I am always cooking for hordes of people or bringing dishes to potlucks and would love some tips/ideas! 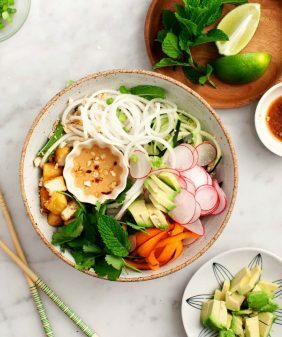 I love the healthy looking beautiful pics as well–my cousin does healthy meal prep and catering and I know that she would love some of these recipes! I love the idea of the carrot sofrito, I’ll have to give these a try! Thanks for the giveaway! The samosa filled poblanos sound really good. I’ve only had samosa filling in actual samosas and a naan sandwich, so it’s good to know that the delicious filling is versatile. The enchiladas look really good too, plus not having to bake them is really nice. I thoroughly enjoy your cookbook. I saw it recently (on display) at the Getty Villa (Malibu, CA) gift store. I was there with my son and his friend, and I remarked about what a great cookbook it is. Kristen Donnely’s “Modern Potluck,” too, looks like something I would very much enjoy. I love to cook, period. 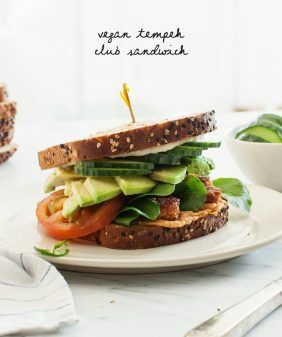 I have a little site that I began a few years ago just to share my own newfound and (mostly) original vegan recipes, but I’ve been a cook of healthy food my entire life. Now I am happy that my three adult children are all beginning to follow suit, and to see the importance of eating and preparing healthy, sustainable, and delicious food! This looks amazing. I can’t wait to make it! Can’t wait to make this recipe! Definitely too hot for the oven these days! The cookbook and recipe look delicious. Can’t wait to try and perfect for a quick nights dinner!! 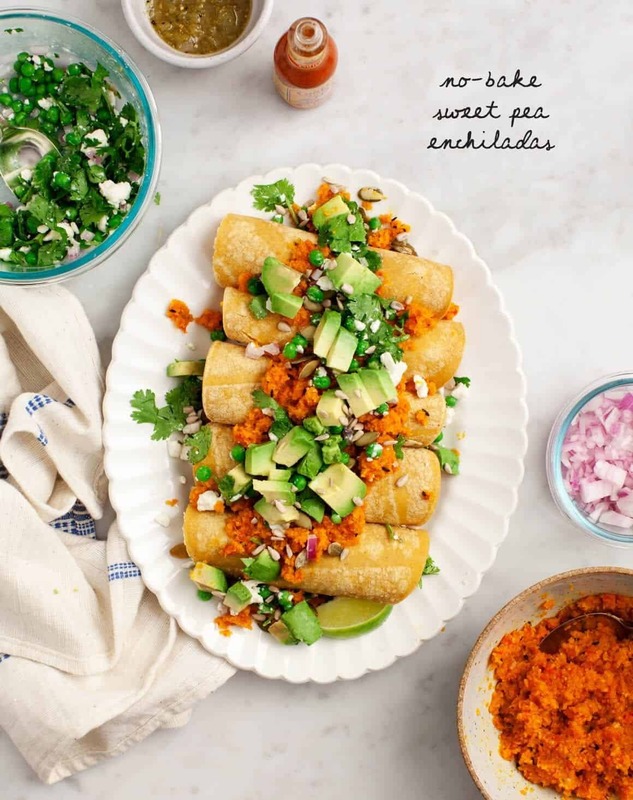 Gosh, this cookbook looks beautiful and those enchiladas look so yummy!! Love, love, love your book ‘The Love & Lemons’. Great idea for a pot luck! This will be the perfect dish for a birthday picnic on Sunday. Although my take-way serving containers won’t look as pretty as that Snapware. Potlucks are one of my very favorite things!! I never would’ve thought to put peas in an enchilada but it sounds tasty! Wow, the presentation is beautiful on those enchiladas! Recently became a vegetarian so your blog has been instrumental in altering my normal cooking and meals at home. Checking out the Modern Potluck book now, would be thrilled to win the tupperware and book!!! This looks so good! I’m always looking for different, fresher, healthier dishes to bring to potlucks or just family dinners to balance out the many mac & cheeses, casseroles, etc (and to break my mold of the dessert-bringer!). I’d love to get a look at everything else in the book! Looks delicious! Going to try making this tonight, it’s the perfect solution to this heat wave. Can’t wait to pick up a copy of Modern Potluck! That looks delicious, and perfect for this hot weather. I’ll definitely add this recipe to my “to try” list, and Modern Potluck to my “to read” list. The recipe looks delicious! Would love to have a copy of that cookbook. Beautiful presentation of delicious and healthy recipes! I would love to know your favorite brand of corn tortillas too. Love the fresh, no bake option for a summer dish. I have this booked saved right now as I love the idea of more communal meals! Definitely making this for my next group gathering- The large number of vegetarians will be thrilled! The food looks amazing! And that cookbook is genius! This recipe looks delicious! Can’t wait to try it, you always share the best ideas! These look so delicious! Definitely going on the menu for next week! These looks so delicious! And perfect for hot summer days when you don’t want to turn on the oven. This looks amazing as well as that cook book! I go to quite a few potlucks so it would be perfect! And that Snapware…. Looks refreshing and delicious. I haven’t made it yet. I wonder is there a way I can soften the tortillas without heating them in oil? Im judiciously using oil in my diet. Would it work to heat each one over a gas flame and quickly fill and roll it? By the way since I cook for two of us, I’m using the toaster oven for almost all baking of savory food. Much faster and cooler. These look yummy and can’t wait to check out the cookbook! I need this book today! I’m hosting a pot luck this weekend and would love to make a few of these recipes. Looks delicious! Thanks for sharing! Thanks for sharing this recipe…I was wondering what to do with those extra carrots in my fridge. Potlucks are the best – and this book looks like a great way to up my game! I can’t wait to give this a try ! 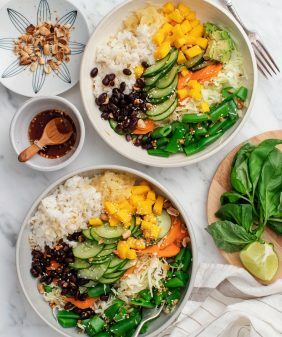 I am always on the lookout for plant based, colorful and delicious recipes! I am looking forward to sharing this on Instagram. The grammar police in me is cringing at potluck as two words, but I suppose to each her own. Any recommendations on making these to feed a crowd/slightly less labor-intensively? Hi Chelsea, the sofrito was the longest part, although it was very easy to make. The rest came together in a snap. This sounds really good, I love the fresh ingredients. I’ve never tried no bake enchiladas! It would be nice to have a resource for potluck or, in reality, party food. This recipe looks great and it seems the sofrito could be used in other dishes too. Thanks for the chance to win. I am so excited about this book! My cookbook club actually just chose it as our selection for October- a free copy would be perfect! Beautiful…would it work without the cheese? Looks delicious! And love that the oven can stay off during these sweltering days! Trying this tonight! Your cookbook has become a staple for me and I never knew I could love meals without meat this much. You opened my eyes to the wonders of eggplants and yellow squash! Loving the look of these no bake enchiladas! 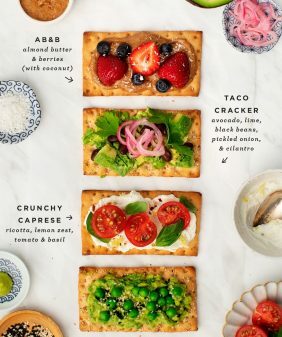 Ohsheglows does a vegan enchilada that I love but I might need to add these to my “to-make” list. Thanks for sharing! Love your cookbooks and your recipes, will take a look at any cookbook you recommend! For any one who goes to potlucks, supper clubs, group gatherings, this could well be my next GANG cookbook!! Looks yummy-and with 100 degree days lingering forever, PERFECT!! Your timing is GREAT!! Thanks!! I am loving my copy of Love and Lemons and am sure I would also really enjoy Modern Potluck! Thank you for all the awesome recipes! I am making the Chipotle Caulifower Tacos for dinner tonight! Always going somewhere that needs food! Love this idea. Thanks for give away. So cool! Potlucks are da bomb and I am always worrying about how to pull them off. Oops, I mis-typed my email address. This one is the right one. Looking forward to making these for our very first back to school family potluck! Thank you for sharing! Love your blog and menu suggestions!! 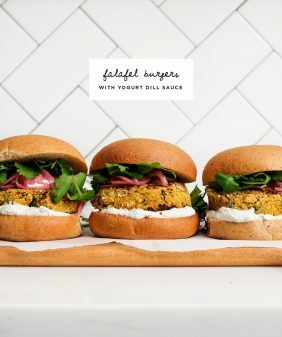 Incredible plant based recipe to add to our rotation. Thank you! These enchiladas look great! Going into my try list. that sofrito sounds wonderful – I would be tempted to throw the peas into that and just dig in with a spoon. I love that pot lucks are making a comeback! It’s always fun to be invited (or throw) a party and making it a pot luck spreads the work…it also encourages a variety of food. I think that’s 1/2 the recipe for a successful party!! I love this recipe, cool and colorful! Can’t wait to try! My daughter loves peas! She won’t be able to resist this! No question about it, Instagram-worthy! The green peas and orange carrots are so pretty together, and the flavors sound just delish. I’ve always done the potluck thing, but never tried hosting. I’m looking forward to learning Kristen’s take and tips on Modern Potlucks. Great idea for a cookbook. 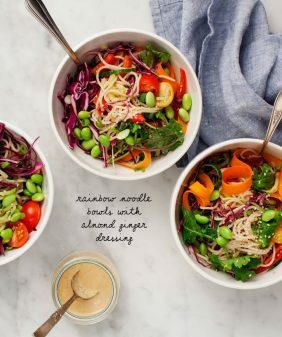 Your “Love & Lemons Cookbook” is an inspiration for healthy eating; the ingredients are accessible and the photographs are gorgeous. Having the opportunity to add another beautiful cookbook to my collection would be a ‘win-win’! Thanks so much for the chance! I love the idea of a no bake enchilada. Count me in for the give-away of a copy of the cookbook! Love all of these ingredients!! Looks amazing!! No bake Enchiladas sound great, esp. In the heat of summer. The potluck cookbook looks very intriguing too. Thanks Haley – I’m so glad you’ve been enjoying the book! Oh I can’t begin to imagine this combination of ingredients…can’t wait to try this. Thanks for the chance to enter this giveaway. I cherish the cookbooks I have collected throughout my life — this one appears to have some delightful, tasty, insightful recipes to offer. I love the idea of no-bake enchiladas. Also potlucks are my fave! I would love to cook meals like this to share with friends and family! I am an outdoor enthusiast and the food I eat definitely influences my performance and lifestyle each day. Thanks for sharing. Looks awesome! Thanks for the chance and the great recipe. You are the best. So excited to try these this weekend!!! What an awesome giveaway! I love yummy potlucks! I love any options that are no bake! Summer heat is hard enough alone! Potlucks are incredibly difficult to navigate. Love that there’s a cookbook on it!! Such a great idea! And these enchiladas look delicious!! This recipe looks amazing! We love to throw dinner parties, but tend to make the same couple of items due to the ease of serving (not necessarily preparation) they provide! It would be great to get some new ideas in the mix – ones that are already tried and true! 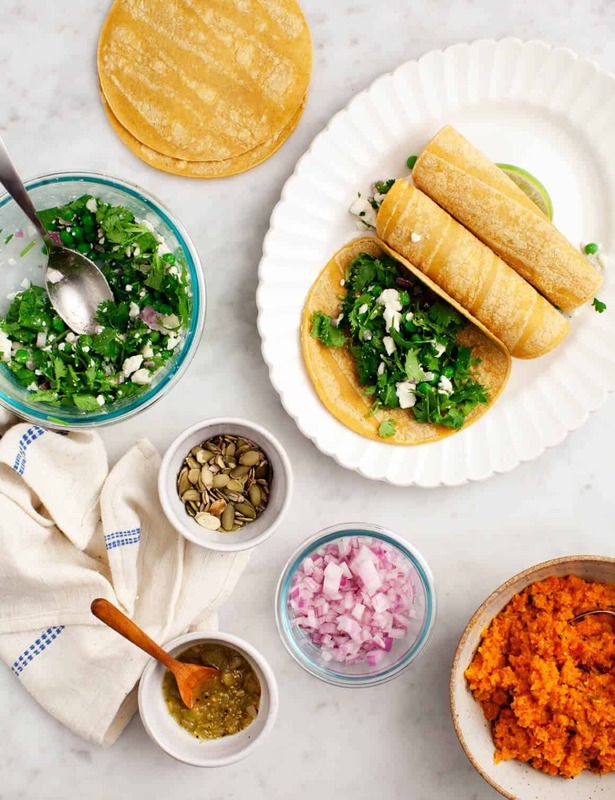 Carrot Sofrito has me intrigued , so off to the kitchen to check if I have all the ingredients to begin this no bake enchilada recipe especially when the ninety degree days of summer are here. Easy to pull together for a small or large impromptu dinner gathering. The book looks amazing and I’d love to cook from it! I love cookbooks, and Modern Potluck looks lovely! Your blog is so delightful, always brightens up my day. Love your recipes and wonderful pictures. Thanks for sharing! This looks delicious! I love your photography, too, it’s fantastic! I’m totally that person that crumbles under potluck pressure! I love cooking, but I cook for my tastes, and know that my taste is not mainstream. I’d love some suggestions to help me vet my favorite recipes! Thank you for sharing – the recipe and the chance to win! Oh goodness, this recipe is mouthwatering! Wanted to do mine now! This cookbook looks great! I love a good potluck and I’m excited to check out recipes that are designed to make ahead and be good for groups. Thanks! Going to make these this evening. Thanks for sharing. Love the combination of flavors. I am adding this to the weekly menu and hoping it’s a hit for the family – it looks delish! I’d love the book AND the storage ware. My old Tupperware is just that — old! We bought your cookbook and overtime I bring leftovers for lunch, my coworkers are always intrigued. I tell them about your book and how easy and delicious the recipes are. Always in a dilemma to what to bring to potlucks. Would love to have this book! My group of friends have been doing potlucks for 20 years – time to breathe some new life into our dishes! Can’t wait to check out this cookbook. Can the ultimate sophistication in the kitchen really blossom from the simplicity of a single ingredient such as a lemon….or a beautiful carrot? Is being mindful and organized worth the effort? Hoping to find out. Thanks for keeping us inspired! #feelinsnappy. Enchiladas are a favorite of mine and I can’t wait to try this delious looking version. The pablanos look amazing to try too! I cook each week for a couple families and I think this book would be great for helping me keep and plan and give them gorgeous food while still making it easier to make large quantities. Love your blog!!! Hope I win! I’m going to see if my local library has this cookbook. Looks like a good read! Wow! The perfect recipe after going to the farmer’s market! What a great idea for a cookbook! Taking the stress out of your potluck dish! My 5 year old daughter loves peas and all types of beans. So I’ll definitely have to make this recipe! Thank you! This looks like such a great weeknight meal! I love the use of frozen peas, such a timesaver! This looks AMAZING! I’m really interested in this cookbook!!! My boyfriend and I have been talking about having dinner parties. We haven’t had the courage to have one yet. Maybe this cookbook is what we need to get us started! Love your blog and recipes! I tried this recipe tonight and it was delicious!! I loved that sofrito. I will definitely make this one again. I would love this cookbook!! Sounds delicious! I have a whole jar of cumin seeds that I don’t really use, so am happy to see a recipe that I could use them in. And I love the ingredients in this recipe! Just received your cookbook as a birthday present (as requested), and placed an order for this one from the library! Can’t wait to try these enchiladas! I would love to have a copy of this book! I love snapware, and I love potlucks. Therefore, I think I need to win the giveaway. This recipe calls for somewhat obscure ingredients — are most recipes in the book like that? Can’t wait to try this, so beautiful!